Update - 2016/07/16: See here for Keen 5! 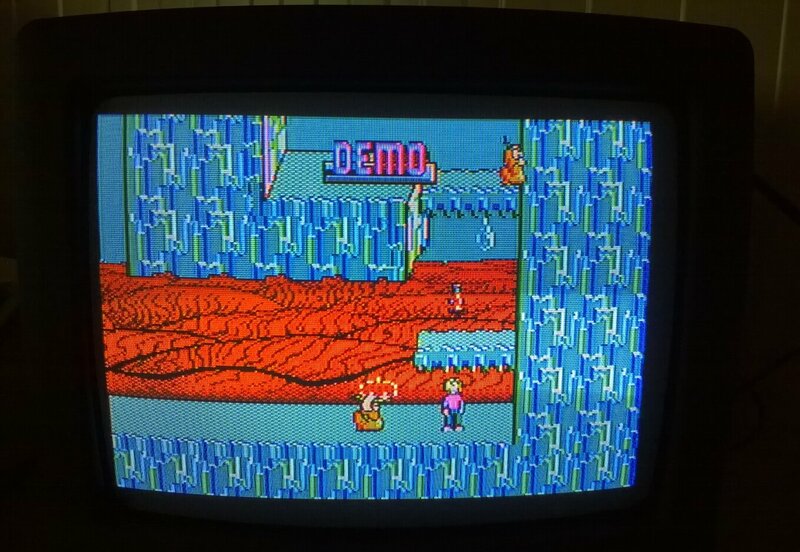 Here's a fully-playable, 16-color enhancement for the original Commander Keen IV- Secret of the Oracle (CGA version), with code patched + graphics redrawn and reworked to support CGA's composite output capabilities. Why, you ask? - just because I wanted to brush up on some skillz... and because John Carmack said that he never knew it could be done. A copy of Commander Keen IV: Secret of the Oracle, v1.4-CGA, Apogee release. This can be downloaded here (thanks keropi). Or, you could just try it out in DOSBox. I highly recommend a current SVN snapshot, patched with reenigne's latest composite CGA improvements (plus the updated experimental PC speaker patch, if you want authentic SFX). These patches may need some manual editing for applying to current SVN, but if you're on Windows, you can use my pre-baked build based on SVN-r3980 with the two patches applied (this is what I used to record the video). Last edited by VileRancour on 2016-7-16 @ 09:49, edited 4 times in total. This is awesome, thanks! Will try it on my 5160 ASAP! Can this patch be applied to Keens 5 and 6 or Keen Vorticons? The PCKF will be VERY interested in this, particularly as a patch for the source code. Can you post it there? keenmaster486 wrote: Can this patch be applied to Keens 5 and 6 or Keen Vorticons? You mean patching the EXEs so that they behave properly for composite CGA, so that modders can make their own CGA graphics for those versions? Well yes, but each version of Keen would need to be patched separately, as they have slightly different engines. So it will require a bit of reverse-engineering to get the patch right for each version. Anyway, fantastic job, both on the patching and the redrawing of the graphics, VileR! Can't wait to see what Carmack will say! excellent work once again VileRancour , thanks for making this!!!! Last edited by keropi on 2016-5-22 @ 22:32, edited 1 time in total. bjt wrote: This is awesome, thanks! Will try it on my 5160 ASAP! Cool! It'll work, although it probably wouldn't be very playable speed-wise on a 'stock' 4.77MHz 5160. (The in-memory patcher adds around 10-15 seconds to the loading time at that speed, too... this may be improved in the future though). I don't have an account there, nor is there a patch for the source code (don't think the source for 4 was ever published)... however, NY00123 indicated that he'd post it there, which is fine by me. Scali wrote: Anyway, fantastic job, both on the patching and the redrawing of the graphics, VileR! Yeah, I'm not sure - I do remember some big noise being made about recovering the sources, but nothing surfaced. What did make it to github is Keen Dreams (https://github.com/keendreams/keen), but that one never had an Apogee release; I suspect that the other games will never have their sources published, as long as they're being sold on Steam that is. Any chance for Bio-Menace even though that had an EGA-only graphics set? Yes, the Keen Dreams code was released as GPL, I forget what version. That code was "upgraded" by the Atroxian Realm (a most excellent fangame) development team (with various bits of code from Catacomb 3D, Wolf3D, et al, plus a lot of newly written code) to replicate the functionality of the original Galaxy engine. Then NY00123 released his "tech demo" which was basically the Atroxian Realm source code (I think, correct me if I'm wrong). Then early this year lemm (on the PCKF) released the "Keen Source Mod" (cksrcmod) which is the Atroxian Realm source code, cleaned up with code added to support all three Galaxy episodes (so if you make some insignificant modifications and compile the code, it will work as an executable for Keens 4, 5, and 6) and vanilla Keen 4 graphics with one demo level tacked on, ready to edit and mod with Abiathar (an excellent Keen level editor by Fleexy). If I'm not mistaken, the cksrcmod is effectively the same as having the Keen Galaxy source code. Currently there is development going on at Keen:Modding for upgrading cksrcmod to use Wolf3D's VGAGRAPH, effectively giving us the VGA Keen we should have had in 1992. Atroxian Realm source code (NY00123 is credited for programming assistance): http://www.pckf.com/viewtopic.php?p=79056 and http://www.shikadi.net/keenwiki/Atroxian_Realm. 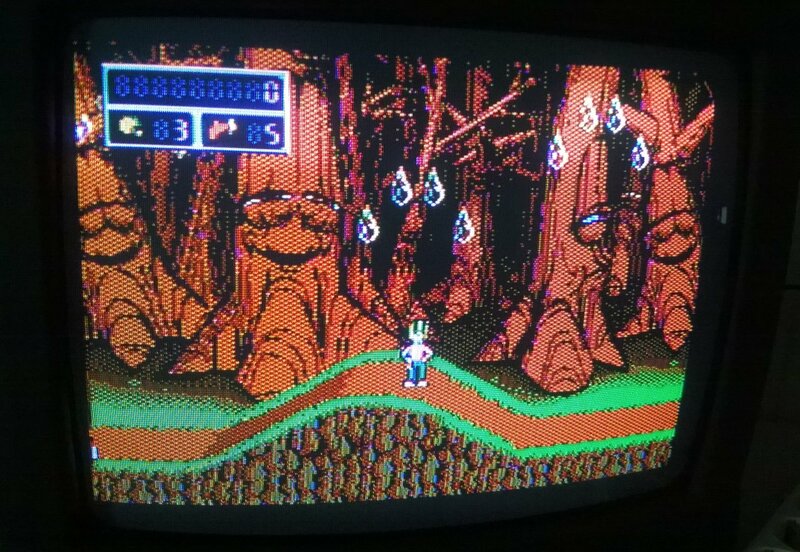 Also, the above 16-color CGA demo has worse graphics quality than the original 4-color CGA version(s). For others: keen4 also has an EGA version which is higher quality than CGA and both also include a soundblaster option instead of pc speaker. x86++ wrote: Also, the above 16-color CGA demo has worse graphics quality than the original 4-color CGA version(s). For others: keen4 also has an EGA version which is higher quality than CGA and both also include a soundblaster option instead of pc speaker. 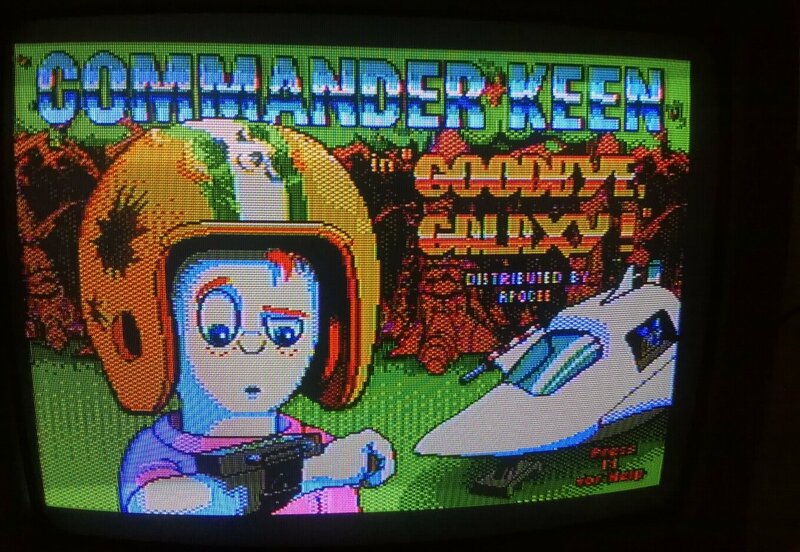 x86++ wrote: keen4 also has an EGA version which is higher quality than CGA and both also include a soundblaster option instead of pc speaker. ...see, that's where I'd normally ask the person about the decision-making process behind posting such a triple whammy of Captain Obvious, but perhaps some things are best left unanswered. keenmaster486 wrote: Currently there is development going on at Keen:Modding for upgrading cksrcmod to use Wolf3D's VGAGRAPH, effectively giving us the VGA Keen we should have had in 1992. Now *that* may be interesting to have a look at - any info/discussion links on that? Anyway, if the AR/cksrcmod codebase is similar enough to Galaxy internally, it should be simple enough to add a composite CGA display option (the changes are listed in the readme, although not in much detail - I could probably help with specifics if needed). Looks good enough on this set! Thanks for sharing. It's difficult to tell from the photos, but does your TV have a comb filter? (I think I see the telltale transitions on scanlines immediately below sharp horizontal edges.) That's something I could have exploited to improve some of the graphics maybe (see here)... but for the sake of notch-filter-only displays, it's probably a good thing I didn't. BTW, must've missed your previous post- thanks for the download link for the original, added it to the OP. ^ yeah it looks good (luckily)! 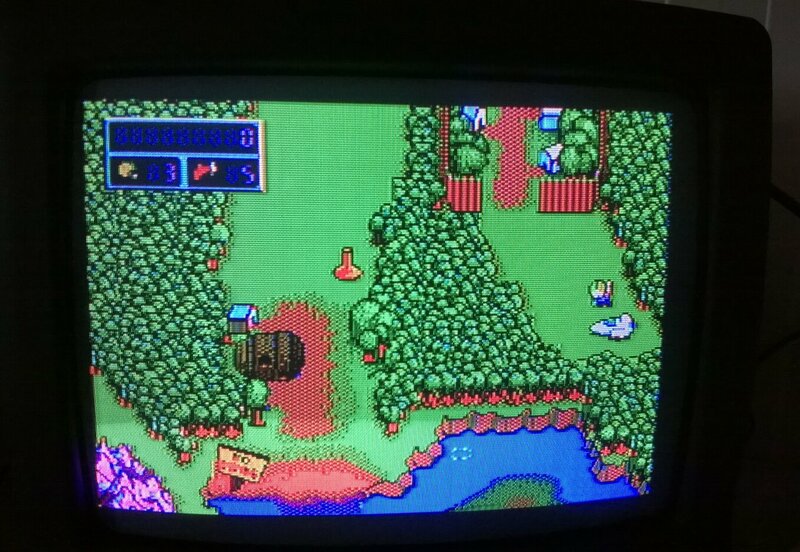 Once again excellent work, on a V20/10mhz the game is very playable and the color is a great bonus! FILE LINK EDIT (MAY 30): Minor updates to .PAT file from VileR; A few groups of patch lines were consolidated, and some bits of unnecessary code were removed (disabling/enabling interrupts across a single port write). I should tell, that I wasn't really familiar with CGA composite graphics (except for maybe mono graphics), and even in these days, out of the DOS games I play, I don't usually try such games. It doesn't change the fact that this is surely some impressive graphics work! * To begin with, back on June of 2014, original sources for Hovertank and the whole Catacombs series were made available by Flat Rock Software: https://github.com/FlatRockSoft/. * For one visual example of how are some of the sources related, you can check the menu from Catacomb 3-D (and compare to Keen 4-6). In terms of tech, especially the ID Engine, Keen Dreams & 4-6, and Catacomb 3-D, are very similar. In fact, Keen 4-6 and Catacomb 3-D use the same revision of the ID Engine (maybe with a few changes). As for Hovertank, I think it's closer to Keen 1-3 in certain ways, but not exactly. Maps use the same format as in Keen 1-3, while the graphics are a variant of EGAGRAPH as found in Keen Dreams & 4-6 and Catacomb 3-D.
* Unfortunately, it looks like we won't see any of the Keen 1-6 sources, although they were found and there was an attempt to get these (or at least 1-5) released ~2 years ago. Last edited by NY00123 on 2016-5-30 @ 20:57, edited 1 time in total.